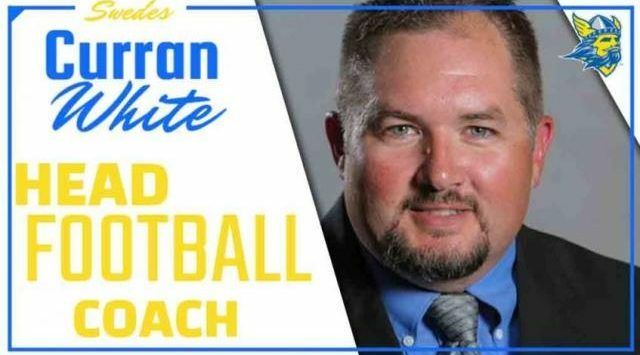 LINDSBORG, Kan. – The Bethany College Department of Athletics announces Curran White as the 19th head football coach in Swedes history. “Coach White is a successful professional who loves God and loves people. With his 18 years of college coaching experience, I am confident he will do a great job leading our legendary Swede football squad. Coach White and his wife Jodi, and their children, will be a wonderful addition to Lindsborg,” Bethany College President, William Jones said. White comes to Bethany with an extensive resume built up over 18 years in the college football world. Most recently, he was the Offensive Coordinator and Recruiting Coordinator at fellow Kansas Collegiate Athletic Conference institution, Ottawa University in Ottawa, Kan. There, he helped turn the Braves from a 3-8 season in 2017 to an 8-2 season in 2018. In addition to this, Ottawa finished no. 14 in the NAIA in Scoring Offense per Game and no. 23 in Total Scoring Offense. Overall, Ottawa was ranked in the top 50 in the NAIA in 10 offensive categories as well as being ranked no. 21 in the most recent NAIA Football Coaches’ Top 25 Poll. From 2012-2016, White was an Assistant Head Coach and Offensive Coordinator at Concordia University in Seward, Neb. At the start of his time, White helped to expand the football program from under 100 players to 135 athletes from 2012-2014. In 2013, the team had its first winning season in over a decade with a 7-4 finish. Then in 2014, the team had the number one offense in Concordia history with 401 yards per game. Off the field the team also saw success being one of 11 national NAIA Scholar Teams in 2015 with a 3.0 team grade point average. In 2016, the Bulldogs went 7-3 with a final NAIA ranking of no. 19, which is the best finish at the school in 15 years. Overall, the Concordia offense broke 10 individual and team school records. Before Concordia, White was the Offensive Line Coach and Run Game Coordinator at Missouri Valley College in Marshall, Mo. from 2005-2011. Missouri Valley went 55-14 overall from 2006 -2011 with NAIA Championship Series qualifications in 2006, 2007, 2009, and 2011. During this time, White was also the Football Recruiting Coordinator for the Vikings. White began his collegiate coaching career at Wayne State College where he was an assistant football coach and recruiting coordinator from 2001-2005. There, he assisted in all aspects of an NCAA Division II football program including: game plan and preparation, academic program implementation, strength and conditioning, fundraising, and summer camps. White has an Associate of Arts degree in Liberal Studies from Santa Rosa Junior College in Santa Rosa, Calif. He then obtained his Bachelor of Science degree in Business Administration and Finance from Wayne State College before getting his Masters in Sports Management, also from Wayne State College. “What a great feeling to become a Swede! I am thrilled at the chance to lead the Bethany football program and humbled by this opportunity. Bethany College is a special place and this is a historic program. Coach Ted Kessinger built a football dynasty here that lasted for decades. I am excited to begin the work to assemble a coaching staff and build a team that will honor the great tradition of Swede Football and make its college and community proud. My family and I look forward to making this our home,” White said. White comes to Lindsborg with his wife, Jodi and their four children.